What are the Best exterior paint colors for me? In my work as a color consultant, many people have asked me what the best exterior paint colors are. It’s a big question! It’s like asking what’s the best ice cream flavor. Ask 50 people about their ideas for house colors and you will most likely get as many answers. Color preference is highly personal. As my grandmother used to say, “and that’s why they make chocolate AND vanilla”. OK, so you’re probably saying, “that’s all well and good but it still doesn’t help me much when it comes to selecting the best exterior paint colors. And you’re right, there’s not much direction there. Hope does exist however and it is real! There are however some set guidelines for choosing the best exterior house paint color palette which I will share with you. These pointers will help you to weed out the poor choices and send you in the direction of the perfect paint color. To make a bad analogy, I’m going to help you find the rainbow, go over the rainbow, and help you get the pot of gold (or whatever other color you like). 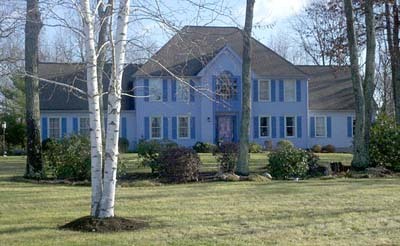 Pictured above, a very common error made when reviewing paint colors; This house is very,very blue, and if you could see the neighboring homes, you'd know immediately just how out of place this potentially beautiful home is. The sweet little paint swatch which looks so good in the hand turns into a raging monster of a color when it is spread over the side of the house. I will help you to understand how to avoid costly mistakes. Now there’s an oxymoron! “Help” you say, “I don’t have a creative bone in my body”. That’s OK because I have a workaround. I will show you how to use your left brain to help your right brain. Or, simply how to apply your highly logical mind to come up with concrete solutions to creative problems such as selecting paint colors. What looks right in town can look downright garish in a suburban setting. Temper the colors to the setting. East coast? Midwest? South?, etc. Regional preferences in paint colors and the quality of the light influence color choice. Do you have to follow narrow guidelines because your house is in a historic district or… maybe you just want to use traditional colors on your older home. Reflected light from water or foliage affects color choices. For example, I live in southeastern Massachusetts on the Rhode Island border. I am about 50 miles from Cape Cod. House colors down on the Cape can take bolder color. The reflected light from the sea makes everything look a bit sharper. The same brighter colors in my neighborhood would look overdone. 2. What style is your house? Cape Cod, Colonial, Bungalow, Tudor, Adobe, Townhouse, Contemporary, etc. Don’t let your grandmother wear your daughter’s mini-skirt! Even though they may both be size 6’s, the same treatment is great on one but badder than bad on the other. Your Victorian gingerbread house will ask for very different colors than your Tudor. 3. What color is your roof? Predominately black, charcoal, red, etc., composite shingled, wood shingles, metal, tile, etc. Depending on how the house presents itself to the street, the roof can be a major field of color. 4. Which direction does your house face? N,S,E, or W? Some colors are more apt to fade with exposure to bright sunlight, do you know which ones? Colors will be magnified or lessened depending on the quality of the light. A house which gets bright sun and is painted yellow may be able to be seen out at sea for 100 nautical miles. I’m just kidding, you can only see about 50 miles to the horizon. Do you have plantings which have unusual color either in their flowering or their foliage? Wow, I Can Breathe a Bit Easier Now! This really isn’t that hard is it? Using a flow chart approach like this automatically eliminates the choices which would not be right. Then you can focus on those that remain. The more questions you ask, the smaller the group of potential colors gets until you are left with just a few. Then the only thing you have to deal with is your personal list of colors you like and those that you don’t. It’s my way of describing how a color scheme or any design is put together. You always have a focal point, the main center of interest and you have supporting members who are not as important as the star but which help flesh the whole thing out.. For instance, your main house color, then your supporting cast; trim, shutters, roof. Often, there is a spotlight that pinpoints a special moment, this can be your front door color. See what I mean? A house gets painted to protect it from the weather so what’s all the hub-bub about color ideas? Well if all paint did was to protect the house, all houses would be white. Choosing your own colors lets you express yourself. It also can change your house from just average to “WOW”. Don’t we all want our homes to be the best they can be? House paint ideas, color palettes and questions answered from your expert color coach! Paint color charts are a quick and easy way to choose safe color schemes. Trim colors can make or break your color scheme. Window trim, soffit trim, white trim, colored trim...learn all about how to choose the best. City Palettes, Sophistication to the Max! Decision Time for House Paint Colors is Now! Resale Paint Colors - Your Path to Sales Success! Picking Outdoor Paint Colors is Easier than You Think...check out the formula! Yahoo Answers Q. and A. White trim paints are not all the same, choose wisely with our guide. An ever growing list of resources and information for the motivated consumer.